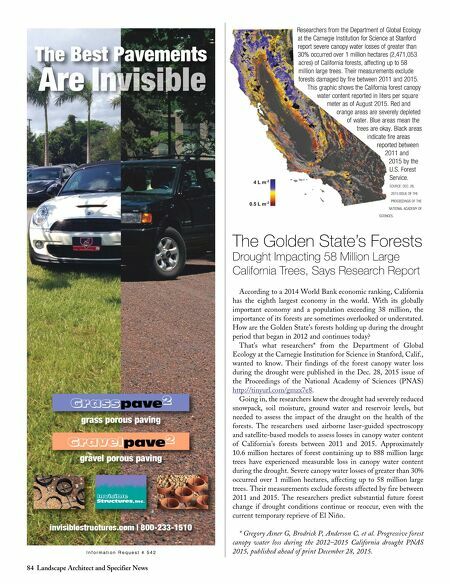 84 Landscape Architect and Specifier News Researchers from the Department of Global Ecology at the Carnegie Institution for Science at Stanford report severe canopy water losses of greater than 30% occurred over 1 million hectares (2,471,053 acres) of California forests, affecting up to 58 million large trees. Their measurements exclude forests damaged by fire between 2011 and 2015. This graphic shows the California forest canopy water content reported in liters per square meter as of August 2015. Red and orange areas are severely depleted of water. Blue areas mean the trees are okay. Black areas indicate fire areas reported between 2011 and 2015 by the U.S. Forest Service. SOURCE: DEC. 28, 2015 ISSUE OF THE PROCEEDINGS OF THE NATIONAL ACADEMY OF SCIENCES. I n f o r m a t i o n R e q u e s t # 5 4 2 The Golden State's Forests Drought Impacting 58 Million Large California Trees, Says Research Report According to a 2014 World Bank economic ranking, California has the eighth largest economy in the world. With its globally important economy and a population exceeding 38 million, the importance of its forests are sometimes overlooked or understated. How are the Golden State's forests holding up during the drought period that began in 2012 and continues today? Ecology at the Carnegie Institution for Science in Stanford, Calif., wanted to know. Their findings of the forest canopy water loss during the drought were published in the Dec. 28, 2015 issue of the Proceedings of the National Academy of Sciences (PNAS) http://tinyurl.com/gmzx7e8 . Going in, the researchers knew the drought had severely reduced snowpack, soil moisture, ground water and reservoir levels, but needed to assess the impact of the draught on the health of the forests. The researchers used airborne laser-guided spectroscopy and satellite-based models to assess losses in canopy water content of California's forests between 2011 and 2015. Approximately 10.6 million hectares of forest containing up to 888 million large trees have experienced measurable loss in canopy water content during the drought. Severe canopy water losses of greater than 30% occurred over 1 million hectares, affecting up to 58 million large trees. Their measurements exclude forests affected by fire between 2011 and 2015. The researchers predict substantial future forest change if drought conditions continue or reoccur, even with the current temporary reprieve of El Niño. * Gregory Asner G, Brodrick P, Anderson C, et al. Progressive forest canopy water loss during the 2012–2015 California drought PNAS 2015, published ahead of print December 28, 2015.